Hello, hello. Seems like I dissappeared for a while! I have taken a little (at first unintentional) blogging break over the summer. At the beginning of June, I felt a little bit drained from the internet/social media and simply just wanted to sit in the sun and enjoy summer. Well, since nobody is actually ‚making me‘ blog, I did exactly that and it was wonderful. Now, with a well-rested brain and autumn (my favourite season) approaching, I really look forward to writing again. It’s just a lot nicer with a cup of tea and the rain outside, isn’t it? Let’s start again with the goals I set myself this September – and tell me how you’ve all been doing this summer! In Spring, I got really good at taking a little walk everyday after dinner. Put a podcast on, walk to the Rhine, maybe take my camera with me – simple as that. It’s really relaxing and at least some kind of movement since I practically don’t exercise. Somehow this habit slipped, so I’m hoping to re-introduce it into my daily routine. I really want to start saving money again, so I’m putting myself on a little shopping fast. I’m by no means a regular shopper, but fair fashion is expensive and I can never say no to a new book or a cute plant. So this month, I solely want to spend money on groceries, gifts for others or nice experiences. I probably wrote this in more than one monthly goal post already, but this time I definitely want to get around to it! First of all, I want to seriously purge my closet of items I don’t wear and finally have that flea market sale. I also really need to sew on a few buttons on my autumn coats and take a few items to the tailor. At the end of September, I want a much emptier closet with only items I like and wear. Along with the downsizing of my closet and the way I spend my money, I also want to be more mindful about how I spend my time. I don’t watch that much TV, but it’s always worth it to go a little fast to see how much I actually consume it. After my social media detox last September, this month is the time to say goodbye to Netflix. I am very lucky in that I actually have a bathtub in my flat. I rarely use it though. So this autumn, I finally want to get all its relaxing power and have some more bubble baths. If that isn’t an easy goal to achieve, I don’t know what is. 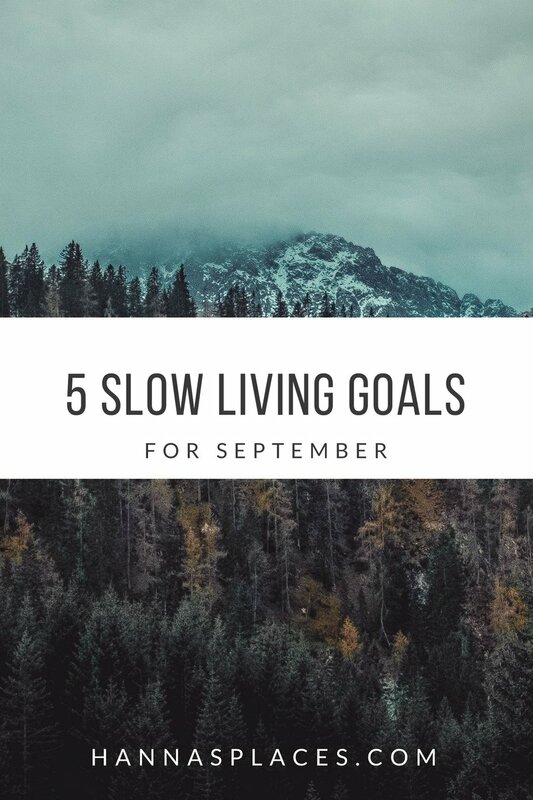 There you have it, these are my slow living goals for September! What about you? Do you set yourself monthly goals and what are you striving for this month?